Kidney stones are one of the most common disorders of the urinary tract. Kidney stones or renal stones are gravel-like collections of chemicals that may appear in any area of the urinary system, from the kidney to the bladder. They may be small or large, single or multiple. One in every 20 people develops a kidney stone at some point in their life. The most common type of kidney stone is composed of calcium oxalate crystals, that promote the precipitation of crystals in the urine are associated with the development of these stones. Common cause is increased consumption of calcium in diet. However, current evidence suggests that the consumption of low-calcium diets is actually associated with a higher overall risk for the development of kidney stones. Multiple kidney stones composed of uric acid and a small amount of calcium oxalate. This might be occurring when fluid intake is less. They may occur when uric acid excretion is increased in urine. This is often found with gout and chemotherapy. Struvite (magnesium, ammonium and phosphate); Struvite stones are always associated with urinary tract infections. Dehydration from reduced fluid intake or strenuous exercise without adequate fluid replacement increases the risk of kidney stones. Obstruction to the flow of urine can also lead to stone formation. 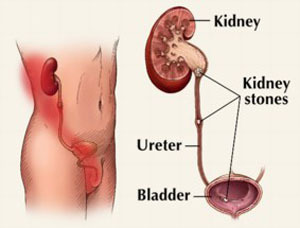 Kidney stones can also result from infection in the urinary tract. Other conditions associated with an increased risk of kidney stones include hyperparathyroidism, kidney diseases such as renal tubular acidosis, and some inherited metabolic conditions including cystinuria and hyperoxaluria. Rarely, a patient reports positional urinary retention (obstruction precipitated by standing, relieved by recumbency), which is due to the ball-valve effect of a large stone located at the bladder outlet. Homeopathic medicines are highly effective in treating acute as well as chronic cases of renal or kidney stones- renal calculi. Homeopathy takes care of the acute pain as well as facilitates and hastens the passage of stone/s in the urine. Homeopathy medicine helps to treat recurrent renal stones even after surgery.